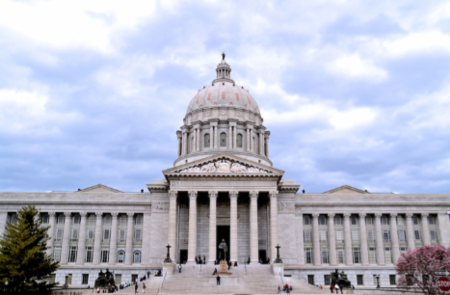 This is the day for visibility and promoting occupational therapy to Missouri’s legislators. It is the opportunity to increase the awareness of the distinct value of occupational therapy in serving the citizens of Missouri. Let’s be OT STRONG! To make policy makers aware of occupational therapy services and the value to the community. To educate our policy makers on the benefits of occupational therapy for our consumers. To assure the inclusion of occupational therapy services in health plans and secure reimbursement for our consumers. To protect our scope of practice. Join us for an online meeting to discuss the details and answer questions pertaining to Missouri OT Hill Day! This is an opportunity to ask questions about Hill Day and received the latest information. If you will be a student attendee, your educational program has additional information concerning your HILL DAY experience. 1. Go to the Missouri Legislature web site and identify your Representative and Senator. If you have family in other areas of the state, also identify their legislators. The more appontments the more the message of occupational therapy will be heard. 2. Learn about your legislator. Locate the web pages for the House and Senate websites. Learn Review their biographies and recent legislation that they sponsor. Sign up for their newsletter. 3. SEND ASAP THE NAMES OF YOUR LEGISLATORS. We will arrange appointments for you. Tours of the Capitol are being arranged with legislators’ offices. Please indicate if you are interested when you email your legislators’ names. In your packet will be handout with Talking Points about legislation of high importance. These will also be available in the Members Only section of the MOTA website the week prior to OT on the Hill Day. 1. AOTA has produced a useful role play videoof a lawmaker visit to help you get comfortable with the process. Please take a look at it as part of your preparation. Review Grip and Grin brochure located on the AOTA website. Copies of Grip and Grin band What is OT brochure will be available at Hill Day check-in. Sign up at Check-In on arrival at Hill Day if you would like to receive continuing competency credits. This applies to licensed occupational therapists and occupational therapy assistants. Business attire is appropriate. Be sure to wear comfortable walking shoes as you will be doing a lot of walking. Bring a camera for those “selfie” moments, business cards if available, and water. Attendees are responsible for their own food and beverages. There is a very small café located in the basement of the House side of the Capitol. There are several small eateries located on High Street on the south side of the Capitol. What Happens on OT Hill Day? Due to the massive external renovation of the Capitol parking and unloading options have changed. The South Circle drive is CLOSED TO THE PUBLIC. There are limited parking spots on the North circle drive. Available Public Parking spaces. Note: on the map the Brown areas have public parking. The City Garage on Madison is $6 daily. Street parking is limited and has time limits requiring frequent refilling with coins. 1. The South Entrance (known as the carriage tunnel entrance and faces High St). 2. The West Public Entrance. Buses will load and unload on the west side of the Capitol. 3. ADA entrances: Through south side carriage tunnel entrance or through the Capitol garage at the lower level of the east side of the building. NOTE: There is a distance of 1-2 blocks walking to the Capitol and carriage tunnel entrances. Located on the 1st Floor. If you entered building thru the West Entrance, this is the Lower Level where there are also restrooms. There are security checkpoints as you enter the South and West Entrances. The Hill Day Registration area is located on the 3rd Floor of the Rotunda. At the Check-in you will receive Information Packets and the Schedule of Appointments. During the day there will be your appointments, opportunities to observe the House and Senate Legislative sessions and hearings, tours, and meeting legislators and staff as they visit the OT exhibit area on the 3rd floor Rotunda area. 3:30pm Exhibits Close and We Celebrate—OT WAS IN THE CAPITOL! You will receive your appointment times when you check-in. How long should my meeting last? You can expect your meeting to last 5-20 minutes depending on the availability of the legislators. The meeting may be in the legislator’s office or you may be asked to meet in the hallway outside of the House or Senate Chambers. Given the legislative business of the day you may need to wait or return later in the day. 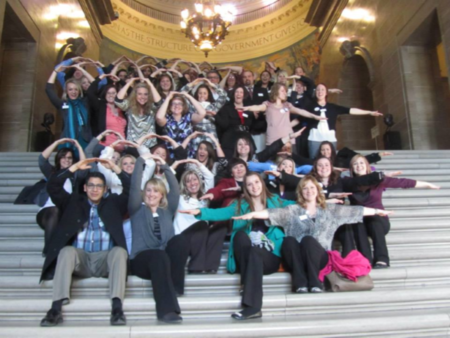 An enthusiastic event shared with over 300 occupational therapy advocates! This is a networking and educational opportunity to listen to legislators and association leaders discuss the current climate in the legislature concerning our practice. Key Legislators discussing concerning current legislation affecting practice and clients; i.e., expanded insur ance coverage for persons with disabilities, Medicaid, telehealth, mental health, legislation impacting our scope of practice. Completion of Thank You cards. Target: 10 to 20 minutes maximum. Arrive ahead of scheduled time. Always be polite and courteous. ►Briefly give your name, where you live, and where you work or attend an educational program. State that you are a member of MOTA, if so, and their constituent. ►If you have a large group of people, appoint representatives to discuss each issue. Ideally, this should be no more than 5-6 people – one to make introductions, and others to discuss your chosen issues. If there is a large group, a legislator make request meeting with everyone together. ►Show an interest in their familiarity with occupational therapy. INCREASING AWARENESS OF OT BENEFITS. ►Tell why it is important to you (e.g., what kind of work you do, the type of individuals you work with, and the situation as you see it) OR tell an occupational therapy STORY about a consumer’s benefit from occupational therapy services. ►Tell why it is important to the them (e.g., what impact it has in their district). ►Detail two or at most three critical issues you think they may be interested in or in which you have expertise or experience. This is an opportunity to tell an OT story! ►Make your arguments with personal stories, which help legislators understand the people side of problems in their own states or districts. 4. ASK for the legislator’s position on the issue. ►Determine the legislator’s views and also, their familiarity with occupational therapy practice. ►Ask if the legislator can support occupational therapy in the future. 5. THANK the member/staff for their time. ►Express hope that this is the beginning of a useful relationship. ►Tell them that you would like to continue a dialogue on issues; ask if you may write or call about the issues in the future. IF UNSURE OF INFORMATION ASKED, SAY YOU WILL PROVIDE THE INFORMATION FOR THEM AND REPORT THIS DURING THE DEBRIEFING. The MOTA Legislative Group will follow-up..
►After the appointment, complete a thank you card. Include a sentence about a point that was in your discussions, to make it more personal. THIS IS A SOCIAL MEDIA DAY! !